Utah Museum of Fine Arts improves its physical and educational spaces. Every once in a while, a home needs to be remodeled. While an art museum is a home for art, it's also so much more. In January 2016, the Utah Museum of Fine Arts was closed for renovations, including much-needed building updates. Since 2001, it has been located in the University of Utah's Marcia and John Price Museum Building—the UMFA's third home in its 66 years of existence. As a part of The American Alliance of Museums, the building must maintain constant temperature and humidity levels to preserve the artwork. A new "vapor barrier" in the walls protects against air loss that might compromise climate conditions. 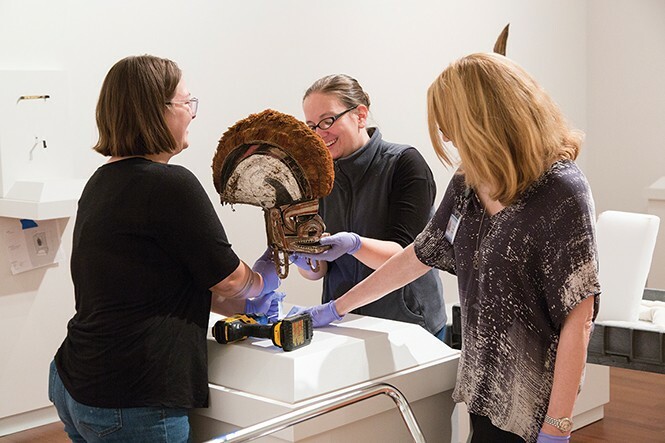 While the physical upgrades were necessary, the staff of UMFA—led by Executive Director Gretchen Dietrich—wanted to take advantage of the closure to similarly enhance both the collection's presentation and the visitor experience. "The mission of the UMFA is to inspire critical dialogue and illuminate the role of art in our lives," Dietrich says. "We took the opportunity to rethink just about everything we do to better fulfill that mission." This process involved two parts. One was finding new ways to display the art itself, which included reshaping exhibit spaces; creating new labels and signage; cleaning and reframing paintings; and presenting more works by women and people of color. The other goal was improving the experience for visitors. That included making the museum easier to find—with more visible outdoor signage—and aiming for a greater sense of inclusiveness, as in bilingual informational materials. The works on display, as well as the accompanying labels and wall texts, have been revised. Almost half of the works are on view for the first time after years of storage—and some have never been seen before. Additional works on paper, which are very light-sensitive, are also now available. Curator Leslie Anderson has redesigned the American, Regional and European art galleries to follow more cohesive storylines. In the third, she incorporates great works to chart the history of European art from the 15th century through the 19th. A centerpiece of this area is "The Tent of Darius" (1660-61), a tapestry by French artist Charles Le Brun, who helped establish the French Academy. As a work of political propaganda that also valorized the Greco-Roman tradition, it exemplifies a number of social forces at work in art. "The new American and Regional art galleries present a more seamless narrative," Anderson says. Westward expansion is highlighted, and she notes, "in keeping with the emphasis on movement, the works displayed demonstrate cultural exchange and artistic mobility." This section, and the entire museum, have been reconfigured to focus on education. "Each installation seeks to expand and challenge the canon by introducing our visitors to artists previously overlooked or under-researched," Anderson says. "The new galleries turn critical eyes toward the rules that have governed art history and museum installations in the past." The contemporary section has been similarly revised by curator Whitney Tassie to present A Fuller Picture: Selections from the Modern and Contemporary Collection, responding to the gender bias in the art world by presenting only works by women. Highlights include Japanese artist Yayoi Kusama's masterpiece painting "Infinity Nets" (1959), Samoan artist Yuki Kihara's silent video "Siva in Motion" (2012), and works by local artists like Jann Haworth, including her sculpture "The White Charm Bracelet" (1963-64, remade 2004). "Progress has been made," Tassie says, "but sexism is still part of the language and structure of the art world." As part of the overhaul, UMFA's African art collection now has a dedicated gallery space for the first time. Virginia-Lee Webb of New York's Metropolitan Museum of Art helped curate this gallery, and through her connections, the museum garnered stunning, rare pieces on loan. The Arts of the Pacific section has also been rethought and reinstalled, with a blessing from local cultural leaders. Also opening in conjunction with the relaunch are two temporary shows: Here, Here, an interactive exhibition by the group Las Hermanas Iglesias, in the museum's new interactive ACME Lab space; and Spencer Finch's site-specific installation in the Great Hall. The two-day reopening festivities include curator talks, tours, films, yoga, kids activities and even a dance party, but it's really about re-introducing people to a phenomenal place to experience visual art. "Great art engages us and connects us to people in the past through many universal themes of humanity: love, death, loss, joy, beauty, pain and sorrow," Dietrich says. "When we spend time with great art, we connect personally to others and expand our worldview. We discover new ways of thinking and seeing—not only the art, but ourselves and the ever-changing world we live in today."